Capitalism creates a society that robs most people of their creative potential, says Phil Gasper I’M SURE it’s not often that the ideas of Karl Marx are discussed in the prestigious pages of the British Journal of Dermatology, but an article published there in January 2008 attempted to throw light not just on Marx’s state of physical health, but also on its supposed consequences for his entire worldview. So far so good—a medical mystery solved, perhaps. But Shuster goes on to argue that, "In addition to reducing his ability to work, which contributed to his depressing poverty, hidradenitis greatly reduced his self-esteem. This explains his self-loathing and alienation, a response reflected by the alienation Marx developed in his writing." Now I’ve actually read quite a bit of Marx, and this description struck me as just a little off. It is true that Marx told Engels in 1867, "The bourgeoisie will remember my carbuncles until their dying day." But while I’ve noticed quite a lot of loathing of exploitation, oppression and poverty in Marx’s writing, I somehow must have missed the "self-loathing" that Schuster talks about. As for alienation, while Marx discusses it at length in his early writings, I personally find what he has to say illuminating and insightful—an analysis of one of the central problems of modern society that is still with us more than a century after his death. 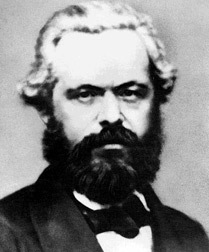 Marx’s most detailed discussion of alienation is in his Economic and Philosophical Manuscripts, which he wrote in 1844 but which were not published until the 1930s. In this work, Marx focuses on what he calls "alienated labor," because he sees alienation at work as the central form of alienation. This is based on the assumption that the need to engage in free, creative labor is a central part of human nature. It’s precisely because capitalism systematically frustrates that need, that it is an alienating system. The problem is that under capitalism work doesn’t have these characteristics for most people. Marx emphasizes two reasons why capitalism “robs workers of all life content." The first is that it is an economic system that accentuates the division of labor, breaking production into a series of smaller and smaller, more specialized tasks, each performed by a different kind of worker, because this will increase profitability. As a result, "the individual laborers are appropriated by a one-sided function and annexed to it for life," depriving them of the well-rounded variety of powers and activities that they need to be full human beings. The second reason why capitalism generates alienation is that it is an economic system in which a small minority controls the means of production, and in which most people can survive only by selling their own labor power. Workers under capitalism have to work for someone else. As a consequence, Marx argues that work has little or no intrinsic worth for the worker —as he puts it, "it is not the satisfaction of a need but a mere means to satisfy needs outside itself." More generally, we find our lives dominated by impersonal powers, from labyrinthine bureaucracies to economic forces, which we are unable to control, even though they are ultimately human creations. In The German Ideology, Marx and Engels describe alienation as "the positing of social activity, the consolidation of our product as a real power over us, growing out of our control." Capital describes the conditions of wage labor as "alienated from labor and confronting it independently," and of capital as "an alienated and independent social might, which stands over against society as a thing." But if we could abolish capitalism and replace it with a society in which workers collectively and democratically control production, then work itself could be transformed into an activity that we would find rewarding for its own sake. It would become a way of exercising our individual creativity and talents, and of contributing to the common good— "not only a means of life but life’s prime want,” as Marx put it in Capital. Third, workers are alienated from what Marx (following Feuerbach) calls their "species-being," in other words from those qualities that make them distinctively human. What distinguishes humans from other species is our capacity to engage in free, conscious, and creative work. But alienated labor reduces humans to the level of animals. Earlier philosophers had seen the distinctive characteristic of humans as our capacity for rational thought. But for Marx it is the application of rational, conscious thought to productive activity that distinguishes us from other creatures. As he says in The German Ideology, "Men can be distinguished from animals by consciousness, by religion or anything else you like. They themselves begin to distinguish themselves from animals as soon as they begin to produce their means of subsistence." Unlike other species, we can step back from activity we perform to remain alive (our "life activity"), consciously assess it, and improve it. As Marx says, "The animal is immediately one with its life activity. It does not distinguish itself from this activity." By contrast, a human being’s activity "is not a determination with which he immediately fuses." Unlike other animals, "the human being makes his life activity an object of his will and consciousness." But under capitalism, labor doesn’t get the opportunity to exercise this distinctively human ability. That’s why Marx says that “in his human functions [i.e. work], [man] is nothing more than animal." He adds that alienated labor "estranges man from his own body, from nature as it exists outside him, from his spiritual essence, his human existence." The final aspect of alienated labor is that, as a consequence of these other forms of alienation, workers are alienated from each other. Marx writes: "the proposition that man is estranged from his species-being means that each man is estranged from the others and that all are estranged from man’s essence." But Marx also argues that alienation is worse under capitalism. In the Grundrisse—the notebooks he kept while he was preparing to write Capital—he wrote: "At early stages of [human] development the single individual appears to be more complete, since he has not yet elaborated the abundance of his relationships, and has not established them as powers that are opposed to himself." It is as ridiculous to wish to return to that primitive abundance as it is to believe in the continuing necessity of its complete depletion. The bourgeois view has never got beyond opposition to this romantic outlook and thus will be accompanied by it, as a legitimate antithesis, right up to its blessed end. So Marx rejects both the romantic view that we should retreat to a bygone era of supposed tranquility, and the bourgeois view that people by nature will always want more and will never be satisfied. People typically experience alienation as an individual problem, and there is a multi-million dollar self-help industry that has emerged offering individual solutions. Even books that locate alienation and unhappiness in a broader social context, like Affluenza by the British psychologist Oliver James, end up offering the same kind of advice. James attacks what he calls "selfish capitalism" for creating the "Affluenza Virus," a "set of values which increases our vulnerability to emotional distress. It entails placing a high value on acquiring money and possessions, looking good in the eyes of others and wanting to be famous." But the solutions that James offers all involve lifestyle changes that are beyond the means of most people. He advises mothers who are suffering from stress, for example, to find a nanny rather than use a pre-school. The truth is that there are no lasting individual solutions to the problem of alienation. Human happiness, wellbeing, and individuality can only be fully realized in a society free of exploitation and oppression, and achieving that kind of society requires a collective struggle to change the world. Simply being participants in that kind of struggle can start to lessen the degree of alienation in our lives, but alienation can only be completely abolished in a society in which "the free development of each" has become "the condition for the free development of all."